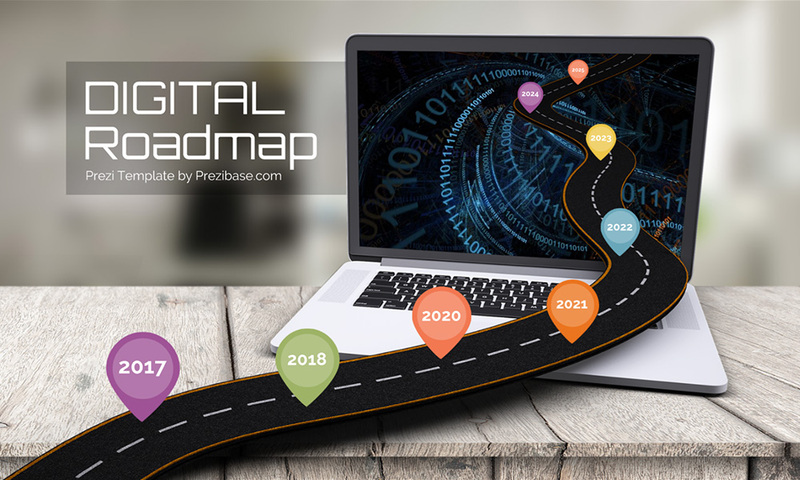 Are you on the right track with your digital strategy and online business? A creative 3D technology timeline Prezi Next presentation template. A curvy asphalt road going into a laptop screen with timeline markers on it. Present about technological developments or IT roadmap in your business. Add more timeline events by duplicating the existing elements. Show the curvy road to adopting to digital changes and digitalizing real world content. This entry was posted in Best Prezi presentation templates, Prezi Next Templates and tagged 3d road, 3d timeline, business timeline template, creative technology, creative technology timeline presentation, digital timeline, infographic timeline template, internet timeline, it, laptop, map markers, online timeline, online timeline template, prezi next timeline, road from laptop, road out of laptop, road timeline, road timeline 3d, roadmap, technology, technology prezi template, technology timeline, timeline, timeline laptop, timeline presentation 3d laptop, timeline presentation template.